Your real job is to perform managerial duties, develop your people and delegate most departmental work to them. This means you have to know what and how to delegate. If you spend your time on departmental work you won’t have time for your managerial duties. Worse yet, you will stifle the growth of your people by minimizing their opportunities to learn and achieve. This leads to unmotivated, unhappy, less productivity workers– and more turnover. As manager you are judged on the success or failure of your people. Department productivity depends on everyone’s efforts, not just yours. Your real job is to nurture and coach employees so they excel individually. Your success comes from their collective accomplishments, so do everything you can to help them succeed. Think of your department as a wheel, with you as the hub and your employees as the spokes. Your real job is to make sure each spoke is strong. Start by carefully hiring the right person for each job, then create a challenging job with opportunities to achieve, train and coach as needed, and monitor performance. Then be sure to recognize those achievements. With a successful department you will be a successful manager. By focusing on everyone else, you are helping yourself. A strong technical background is a plus when it helps you fully understand an assignment so you can properly delegate it: what should be done, why it is important, and what the results should look like. Furthermore, a technical background enables you to coach effectively. HOWEVER, a strong technical background is a disadvantage if you continue doing the work yourself, if you micromanage after delegating, or if you insist on having things done only your way. Just because you are capable of doing the work is not an excuse for doing it yourself or dictating how it should be done. If you are personally involved in any workflow, act quickly. If you delay any decisions or any part of the work process, you are the bottleneck. I once had a boss who reviewed every market research proposal. He sat on them so long that, by the time he decided to approve a study, it was sometimes to late to do the work. He was the bottleneck. Delegate work that is challenging, adds responsibility or further develops an employee’s skills. Try not to do any meaningful assignment yourself if someone else in your department can do it, unless it is confidential or intended only for managers. Delegating meaningful work makes the employee’s job more challenging, reduces frustration, increases job satisfaction, and helps build self-esteem. And most importantly it 1) gives the worker more opportunities to achieve and 2) gives you more chances to recognize those achievements, the two most important motivational factors. Clearly define the assignment, goals, deadlines, and your expectations. Explain why the assignment is important to the company or the customer. Ask how the employee feels about it and discuss whether any new training is needed. Then ask for a commitment. People are more likely to commit if they fully understand an assignment and why it’s important. After you delegate, get out of the way. 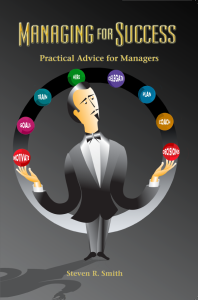 Be available as a coach and consultant, but avoid micromanaging, which disrupts the process and causes employee frustration. Wait a few days and then ask the employee how things are progressing, if any questions have come up since the project was assigned, and if the timeline still seems reasonable. The answers will tell you how well the employee understands the assignment and if anything needs clarification, and it alerts you to any anxiety or confusion that could impede the desired results. Some duties and assignments should not be delegated and you must do them yourself. These include planning, budgeting, hiring, enriching jobs, performance reviews, staff development and sensitive assignments from top management. Try not to delegate to someone who is not good at or dislikes that type of work. Doing this forces people to be mediocre. Put people into positions where they enjoy their work and are good at it.